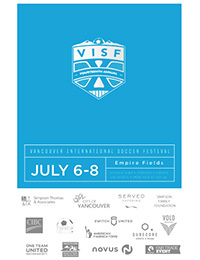 The Vancouver International Soccer Festival (VISF) is lacing up to kick off its 6th year on Saturday, June 26, 2010 as Canada's most exciting World Cup-style soccer tournament and multi cultural celebration! Pending funding, a mix of palestinian Israeli team from Israel/Palestine to play at the tournament on June 26-27 at Andy Livingstone Park, Vancouver CANADA! Come out and enjoy a world cup-style tournament featuring fun, food, and festivities for the whole family. Free Admission! High Resolution pictures and promotional material for media use are available upon request. Contact ahamael@visf.ca for more info. 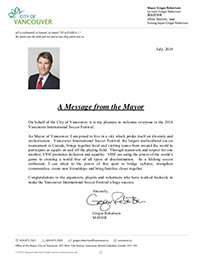 "The 2009 Vancouver International Soccer Festival was a huge success with over 400 soccer players, 2000 spectators and numerous teams representing countries throughout the world. The event was a great demonstration of community and sportsmanship. 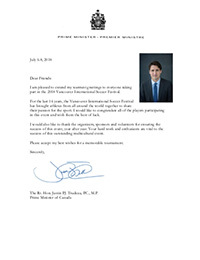 The VISF was timely as well with June 27th representing Multicultural Day in Canada." "Adri Hamael became passionate about soccer during hi childhood in Jordan, the country his Palestinian family fled to after being displaced from their West Bank home." "The Founder of an annual charity soccer tournament that benefits sick kids and youth living in war-torn countries says while this year's event wasn't planned around the World Cup, the timing couldn't be better." "A Palestinian-born Vancouver man is using soccer to bring Israeli and Palestinian youth to B.C. to attend the Gulf Island Film and Television School in August." Come out and enjoy a World Cup-style soccer tournament featuring fun, food, and festivities for the whole family. FREE Admission!